Can any of you guess what we found in our garden on Sunday night? No, it wasn’t another new Google service (although they do seem to be popping up all over the place recently) – it was a hedgehog! We were a little concerned for its well-being as hedgehogs usually only come out when it’s dark and it was still daylight. We already knew we shouldn’t feed it bread and milk, but didn’t know what else we could do to help it. After searching the Internet for a local rescue centre, we found the Voluntary Rescue Centre for Birds and Wildlife website and phoned them for some advice. Although this hedgehog was quite small (4 to 5 inches long) it could still have been old enough to have offspring, for which it could have been foraging for food. As a result, Midge (who voluntarily runs the Rescue Centre with his wife) suggested that it would be a bad idea to rescue it in case it was going to find its own way back to its family. So, we bought some cat food (no fish varieties allowed for some reason) and put it outside on an ice-cream container lid along with some water. The hedgehog quickly discovered the food and then ran pretty quickly around our fence into next door’s garden, then right across the middle of their garden into the corner next to their shed. We assumed it was going back to tell its family that it had finally found some food! When Monday morning came, the ice-cream container lid had moved towards one of the doorways I’d made and half the food had gone. We assumed some clever cat (or other animal) had managed to carefully put its paw inside the box and dragged the food nearer to the door so it could eat it. Our poor, hungry hedgehogs! After setting it up again last night, it looks like our hedgehog might have been back, as this time the lid was licked clean! The old Romany (gypsy) way to cook a hedgehog is to roll it in clay and bake it in the embers of a bonfire. When ready, the clay is broken open and the spines come away still embedded in it. Be careful about making houses for hedgehogs. If there are rats about they may find it equally suitable. qyuick quick ..lets start a "hedgehog" google service rumor !! I have had a pet hedgehog! 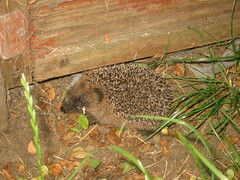 i have 2 blogs about hedgehogs! My pet hedgehog was a pygmy hedgehog! She liived for 6 years! e-mail me at walshramsay@aol.com and i can answer you!